Decided to take advantage of the Boxing Day holiday and take the girlfriend and her brother to have a quick fish down at Port Hacking. Went to pump a few yabbies on sunset the day before and were kept alive on an aerator. Took the yabbies down in hope to catch a few bream and whiting. There were a lot of bites but mainly small snapper, bream and whiting, nothing near legal size. Just before we were to leave, the girlfriend asked to have a go at the squid. We threw in a green Yo-zuri for 10 casts for no result. Decided then to change colour and size to a larger orange Yo-zuri. On first cast, without even having to jig it, a squid was on and already trying to pull away. 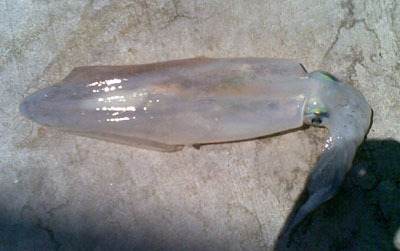 Up came a nice sized arrow squid at approximately 30cm.